Huawei has just announced new colours and new sizes for the Huawei Watch GT, in its attempt to take down the Samsung Galaxy Watch Active and Apple Watch Series 4. They're called the Huawei Watch GT Active Edition and Huawei Watch GT Elegance Edition, and these new additions to the range should make the smartwatch more appealing, especially to those with smaller wrist. 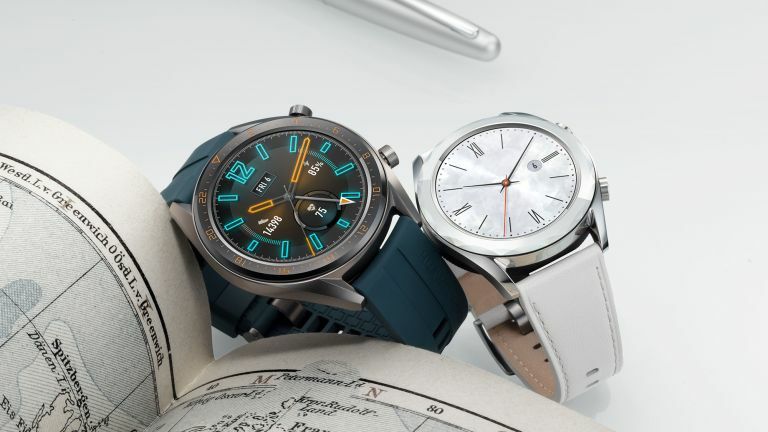 The Active is the larger of the two smartwatches, featuring the same 46mm case as the Huawei Watch GT Classic and Sport Editions, while the new Elegant Edition features a smaller 42mm diameter. The Active is fitted with a 1.39-inch AMOLED touchscreen with a resolution of 454 x 454 pixels, while the Elegant Edition has a 1.2-inch AMOLED touchscreen with a resolution of 390 x 390 pixels. The Active has a long, two week battery life. That's pretty impressive, and much longer than its rivals, while the Elegant Edition has a one week battery life, which is obviously quite a bit shorter, but still outperforming its rivals. Both new smart watches feature the same range of indoor and outdoor fitness tracking abilities as its predecessor, with one extra mode thrown in; Triathlon mode. This new mode will track your open water swimming, outdoor cycling, and outdoor running, including the transition time. This mode will be added to existing models with a software update. The Active and Elegant Editions will use the same 'TruSeen 3.0' heart rate sensor and TruSleep 2.0, which monitor your heart rate and sleep. The new colours of the Elegant Editions are achieved through the unique ceramic colouring process. These are called Magic Pearl White and Tahitian Magic Black Pearl. The Magic Pearl White watch face is achieved through a diamond-level cutting process that creates 48 small triangular cuts and then precisely polished. Both watches also have a verity of new watch faces (one of our biggest problems with the previous model). We can't wait to try out the new Huawei GT smartwatches, check back soon for a full review.